There are some foods which are almost religiously revered by Georgians, who generally like to have a good snack. Shashlik (mtsvadi in Georgian) is among them, surpassed in the Georgian "food charts" perhaps only by khinkali. 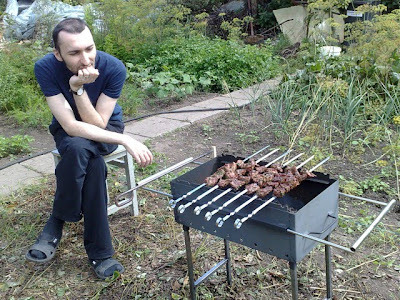 Since I happen to be Georgian, I share the common genetic weakness for shashlik, naturally. As with any sort of grilled meat, there is no tastier shaslik than the one made outdoors, preferably in nature's lap, with your own hands. The process itself is a whole ritual, gradually preparing your gastric juices for the grand finale. Luckily, I live in a countryside (sort of), and I have a wife who knows how to marinate the meat overnight. 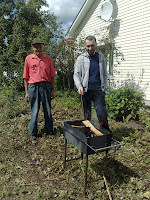 Ever since I moved to Lithuania, making shashlik in the backyard became one of my most persistent obsessions, as if it was some sort of connection to my homeland. We even bought mangal and skewers earlier this summer, but something had been constantly preventing us from actually using them -- busy schedule, unpredictable Baltic weather, etc. The other day, at very long last, we were able to test the equipment in action. 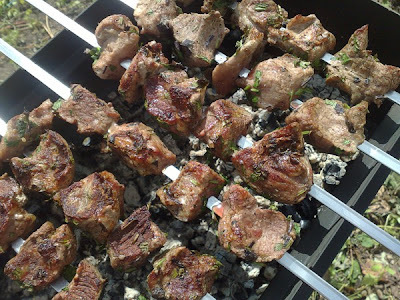 Diana's father helped preparing the charcoal (we used birch logs for that), and when it was all smouldering, I skewed the pieces of marinated meat and placed them on the mangal, while Diana was taking pictures of this event of the month. Not everything went as smooth as I expected, though. Apparently, we should have had produced more charcoal, because the heat turned out to be not enough for a fast grill and it all dragged on for an eternity. But the wait was really worth it, I must say. A little taste of homeland, if you will. Although, I've noticed that shashlik is quite popular among Lithuanians, too -- making šašlykas, as it's called here, is one of the favorite weekend pastimes for many locals. Skanaus!